My mother ran a small caramel business out of our home. But these weren’t some run-of-the-mill confection you get at the grocery store. Her caramels were so good, they became a sensation within our small town. She first began selling them as a way to earn money while taking care of my sister and me. Word of mouth traveled fast; she traded them for haircuts, babysitters, and other necessities. Her caramels were in such high demand that they soon turned into a viable way for her to earn an income while staying home and taking care of two kids. I soon became my mother’s right hand in the kitchen—playing sous-chef as I helped her make large batches of caramels to fulfill orders. I loved working beside her as she grew her humble business into a local phenomenon. It quickly became our way of bonding, just us. I started out wrapping the candies individually, stuffing them into clear plastic bags adorned with golden ribbons, then cutting them into squares. During the busy season, I’d stay up far past my bedtime listening to The Talking Heads as we completed the orders for the next day. I loved pretending that I was a pastry chef; it made me proud knowing I could help my mother and make her life easier. Eventually I was promoted to designated pot stirrer. Taming the hot sugar made me feel like a grown-up, my mother’s caramel recipe a veritable document of my childhood. Now, 20 years later, my mother’s revelation got me wondering: If a touch of salt can take something that’s already perfect and make it even better, what would a touch of acid do to caramels? After all, chefs always toot the benefits of adding both salt and acid to food, so adding a touch of vinegar to my mother’s caramels should make them better, right? I decided to test out my theory. So with her words of wisdom in mind, I dove into the caramel-making on my own for the first time. 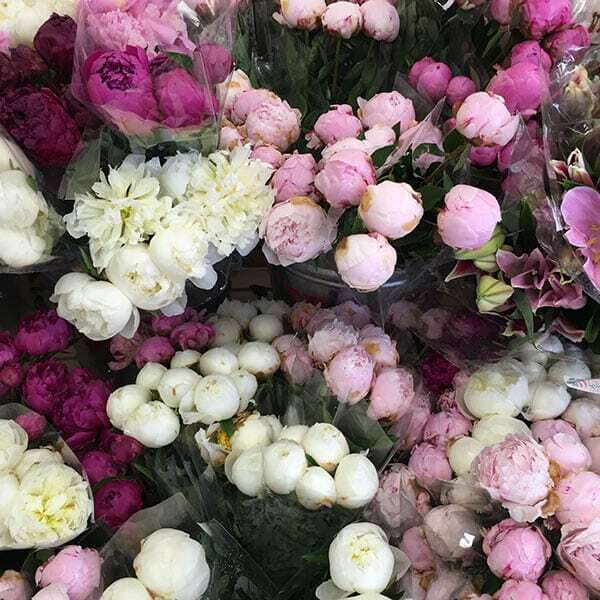 Smooth, reflective, and mahogany-colored, they smelled just like my mother’s, only punchier and more acidic. The scent of burnt sugar took me way back, yet the sharpness of the balsamic hit my nose in a new way. I can’t say that the vinegar made the caramels better (I could never! ), but it certainly created something entirely different and exciting. They were bright, rich, and complex; you wouldn’t think you were tasting balsamic vinegar, yet you’d know there was something else going on. Just like adding flaky salt enhanced my mother’s caramels, the balsamic added depth, too. It was both familiar and foreign, my mother’s old recipe, born again, in my kitchen. Does the internet need another blueberry muffin? Absolutely not. But this is my story and my blog and I make what I want. Lol. All kidding aside, I wanted a blueberry muffin recipe that I could whip up when people came over. I wanted a very good blueberry muffin recipe! I wanted it to be moist, not dry and gross. I wanted the top to be crispy and delicious. I wanted that bakery-style domed top that is so hard to achieve but looks so beautiful. And I wanted it to be easy, easy! Well, good news is that most muffins are super easy to make. This one is super simple: wet ingredients are poured into dry ingredients. Using both butter and oil mean good flavor (hello butter) and oil means they’re super moist. The wonderful dome topping is due to two things: resting the batter for at least an hour, but ideally overnight. And having the oven set to 400 degrees for the first 7 minutes. The high temperature creates steam, making the muffins super puffy. The muffin is then baked for the remaining time at 350 degrees F. The crunchy top is thanks to the high temperature and a bit of turbinado sugar. And that’s it! Those two little things contribute to this super delicious muffin. Bakery-Style perfectly domed blueberry muffins. These are moist, delicious, not overly sweet and are very good blueberry muffins. Place muffin liners in a muffin tin and set aside. If your liners aren’t made of parchment and just paper, you might want to spray them with cooking spray. In a bowl, toss the blueberries with the teaspoon of flour and set aside. In medium bowl, whisk together the buttermilk, melted butter, sugar, neutral oil, eggs and vanilla extract. In a large bowl, whisk together the flour, salt, baking powder, baking soda. Pour the wet ingredients into the dry ingredients and mix until barely combined. Add the blueberries. Cover the bowl with plastic wrap and allow to rest for at least 1 hour, ideally overnight. Preheat the oven to 400 degrees F. Divide the batter amongst the twelve cavities in the muffin tin. Sprinkle the tops with turbinado sugar. Transfer to the oven to bake for 7 minutes. Then immediately turn the oven’s temperature down to 350 degrees F and bake for an additional 10 to 12 minutes, until the tops are lightly golden brown and nicely domed. Let the muffins cool in the pan for 10 minutes and then carefully remove and allow to cool on a cooling rack. Roll the dough starting closest to you and going up. Divide the dough into two and transfer to a cutting board. Place it in the freezer to chill for 10 minutes. I find that slicing cold dough is WAY easier. Remove from the freezer and slice the rolls into 1 1/2-inch rolls, about 12, trimming the ends off. This chicken is so easy to throw together. The chicken marinates for at least 4 hours or up to 24 hours. The marinade is in style of pollo a la brasa (this recipe is adapted from huacatay (or you can use fresh mint), peppers and more. It’s an easy marinade that gets mixed together in a blender. It’s poured over the chicken and then roasted in the oven, per the way Zuni Cafe does it. The bread salad is SO delicious. If you can’t find radicchio feel free to substitute another sturdy lettuce. This meal is simplicity at its finest. Just good food. The aji verde is SO delicious and if you’ve ever been to a pollo a la brasa restaurant, you’ll immediately recognize it. They usually place it on tables. It’s glorious. My favorite Peruvian chicken: pollo a la brasa married with the style of famous Zuni Cafe’s famous chicken served with a bread salad. To a blender, add the soy sauce, red wine vinegar, huacatauy (or minced mint), pepper, fresh ginger, garlic cloves, cumin, paprika, kosher salt and freshly cracked pepper. Blend until mostly smooth. To a large bowl or large plastic resealable bag, add the chicken, along with the sauce. Mix until combined and cover; transfer to the fridge to marinate for at least 4 hours, but ideally 24 hours. Remove the chicken from the fridge. Holding the chicken over the trash, tilt the chicken and allow the marinade to run off in the trash. Place the chicken back on a wire rack or cutting board and using clean kitchen towels or paper towels, dry the chicken on both sides. Place a 12-inch cast iron skillet or shallow baking dish in the oven. Preheat the oven to 425 degrees. Meanwhile, allow the chicken to come to room temperature while the oven preheats. Open the oven and slide the rack out. Breast-side up, place the chicken in the pan; it will sizzle a lot when it hits the pan—that’s great! Roast the chicken until you see the chicken breasts start to blister and brown, about 20 to 25 minutes. Carefully remove the chicken from the oven and flip the chicken over. I found that using a pair of tongs and clean kitchen towels were super helpful. Return the chicken back to the oven to cook for an additional 25 minutes, until the opposite side is super golden brown. I took a peak at the chicken periodically to make sure it wasn’t getting too browned. Insert a meat thermometer into the deepest part of the chicken (where the leg meets the thigh) and you’ll know it’s ready when the thermometer hits 165 degrees F.
Bring the oven temperature down to 400 degrees F.
To a baking sheet, add the bread cubes, along with the olive oil and a few pinches of salt; toss until the bread cubes are evenly coated in the olive oil. Transfer the bread cubes, along with the walnuts to a baking sheet. Place in the oven and bake until evenly browned for about 10 minutes. Remove and allow to come to room temperature. Meanwhile, add the pan drippings to a large bowl. Add the red wine vinegar, a few pinches of kosher salt, lots of rounds of black pepper; give it a taste and adjust the salt to your liking. Add the kale and raddichio and toss until evenly combined. Next, add the warm walnuts and bread cubes from the oven; toss until combined one last time. Transfer back to the pan (to serve) or a platter. Place the rested chicken on top and serve. You’re also welcome to carve up the chicken and serve that on top of the salad. Let me just say that I cannot believe I don’t have a recipe for regular Alfajores on this entire blog. It shook me to my core. A long time ago, I posted a recipe for Mini Alfajores but I don’t have just regular size ones. Also, I’m now grown and am a whole lot better at baking so I think this recipe is definitely superior. I’ve played with the cookie a bit and am very into this ratio. A lot of Alfajores are made just corn starch but I’ve always felt like they were a bit too chaulky for me. So this is a nice in between. It has some flour, some corn starch and powdered sugar (which obviously has corn starch in it). And added egg yolk gives it a nice richness and since I was feeling fancy, I used some vanilla paste, which I use incredibly sparingly since it’s so expensive (but has recently gone down in price). This biggest difference between Peruvian Alfajores and Alfajores from other parts of South America is that we don’t call it dulce de leche, we use the term manjar blanco. West of the Andes mountains, the term manjar blanco is used, east of the Andes mountains, the term dulce de leche is used. In Colombia the term “arequipa” is used. Argentina – In Argentina alfajores are typically made with all corn starch and the sides are rolled in shredded coconut. Chile – It varies from parts in Chile, but some of the cookies are a bit thicker and there are times when nuts and meringue are folded into the mix. Meringue honestly sounds super delicious. And there are time where the entire cookie is dunked in chocolate. Bolivia – The alfajores are a cross between Argentinan alfajores and Peruvian alfajores. They are usually mixed with all-purpose flour and rolled in coconut. I find the differences so interesting and so cool. If you have anything to add, PLEASE LEAVE A COMMENT BELOW! When I was in Peru, I went to this bakery and was blown away by the alfajores. They melted in your mouth. So good. The one I had was rolled in powdered sugar and the manjar blanco had a subtle cinnamon flavor to it, which is typical. I remember when my Tia Emilia would visit from Peru and would make the manjar blanco from scratch. She’d add the cinnamon stick and whole cloves and would stir and stir. The entire house would smell so good. This recipe below offers some short cuts. The brand La Lechera sells dulce de leche already in the can. I offer an option of adding a pinch of cinnamon and cloves to these and mixing it in. This is a super quick and easy shortcut and guess what: they’re still amazing. I also offer a recipe to make the manjar blanco from scratch. It’s delicious so choose whatever filling best suits your mood and time limits. When I was in Peru a couple months ago, we went to a few more modern bakeries and they had various sizes, different flavors and it made me super excited to make new twists on this classic. But first, you gotta start with the basics! So here she is…enjoy. These are Peruvian alfajores. Manjar blanco that is spiked with cinnamon and cloves is sandwiched in between two light shortbread-like cookies. The sides are rolled in powdered sugar. To a medium bowl, add the store-bought dulce de leche, along with the cinnamon, ground cloves and salt. Mix until smooth and completely combined. Set aside. To the medium bowl, whisk together the all-purpose flour, sifted corn starch, powdered sugar and salt. Set aside. To the bowl of a stand-up mixer (you can also use a medium bowl and an electric hand-mixer), add the butter and vanilla paste or extract. Beat until smooth. Next, add the egg yolk and mix just until incorporated. Add all of the flour mixture and slowly mix it together (being sure not to go too quickly or else the flour will fly out of the bowl), until combined, about 1 minute. Scoop the dough out of the bowl and form it into a ball. Place it in the center of a sheet of plastic wrap and press it into about a 2-inch round. Wrap it tightly in plastic wrap and transfer to the fridge to chill for about 1 hour. When it’s done resting, in the fridge, transfer the dough to the center of a sheet of parchment. Place a sheet of parchment on top and roll it out slowly. (If it’s too cold, let it come closer to room temperature, about 10 minutes.) Roll it out until it’s about 1/2 to 1/4-inch thick. Using a 3-inch cookie cutter, stamp out cookies, having them as close to each other as possible. Transfer the cookies (I found it easiest to use an offset spatula to pick up the cookies) to a parchment-lined baking sheet, spacing them about 2-inches apart. Transfer to the fridge to chill for about 10 minutes. Repeat until you work your way through all of the dough. I rerolled the dough about 2 more times. Score the tops of the cookies with a tines of a fork. Transfer to the oven to bake for about 12 to 13 minutes, until the cookies are a bit firm to the touch but have zero color on the edges. These cookies are baked just until set. Allow to cool on the baking sheets until room temperature. When the cookies have cooled, flip half of the cookies on their opposite side. Transfer the manjar blanco to a piping bag with a piping tip attached (this part is optional). Pipe a round of manjar blanco on all of the cookies facing their opposite sides. Alternatively, you could also spoon the manjar blanco onto each of the cookies and smooth it out (gently because the cookies are delicate) using a butter knife. Top each of the cookies with another cookies and lightly press it down. 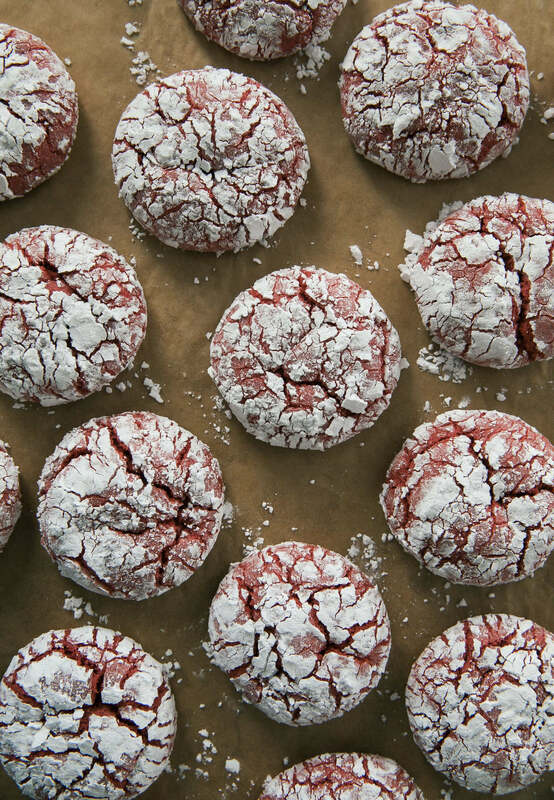 Roll the sides in the sifted powdered sugar. Store in an air-tight container or bag for up to 3 to 5 days. Let’s talk about conchas! Also known as pan dulce aka sweet bread. When I moved back to California after I graduated college, I realized I literally knew nothing about Mexican food. I, of course, had eaten a good amount of Mexican food when I lived in the OC as a little kid. But I don’t think I understood what I was eating. I also don’t think we ate a huge variety of Mexican food. And to be honest, my mom cooked most of the meals we ate. We weren’t a super “go-out-to-eat” type of family. That woman was on a budget! When I finally moved back to Los Angeles, after college, I started to really understand and learn the different varieties of Mexican food and it was cool. I learned the differences between food from Baja, Mexico City, Colima, the Yucatan and Oaxaca. And my actual trips to Mexico have been even more educational. One of my favorite places I went to in Mexico City was a pandaeria where they served the warmest, freshest conchas with the crispiest tops. If you’ve never had a concha, they go a little something like this: on the bottom there is a brioche-like dough that’s rolled into rounds. The top is a streusel-like shell that’s been mixed until it’s super smooth, patted into a thin round and draped over the dough. A concha-shaped cutter is pressed into the top (or you could use a knife to score it). Then it’s baked (after a quick rise). The top is crunchy and crisp, the bottom half, fluffy and soft. They’re typically eaten at breakfast time with a mug of hot chocolate or coffee. While conchas are for sure Mexican, their origins go back to Europe. Many pandaerias were influenced by the French, who migrated there for who knows why, bringing their doughs and technique to Mexico. Mexican chefs adapted these doughs and created many of the goods you see in pandaerias today. I actually love learning about history in food. I think it’s fascinating, especially in Latin America. I recently bought a few books (they’re on their way to me), hoping that it’ll teach me a thing or two about our food history. I’ll share more info when I learn it! In the mean time, let’s make some conchas! Conchas are also known as Pan Dulce and Sweet Bread. This Mexican breakfast item is made of a fluffy, butter brioche-like dough topped with a streusel topping that is scored. These colorful Mexican breakfast item is a crowd favorite. To the bowl of a stand-up mixer with the hook attachment (you can also do this in a large bowl and knead it by hand! ), add the warm water. Pour the active dry yeast on top and mix in into the water. Allow to stand until foamy, about 5 to 7 minutes. If it doesn’t get foamy then you’ll need to do it again. When the active dry yeast is foamy, pour in the vegetable oil, melted butter, granulated sugar, evaporated milk, salt, vanilla, ground cinnamon and eggs. Break up the eggs with the back of a spatula and allow the dough hook to mix it up a bit, about 30 seconds. Next, pour the flour in all at once and run the machine for about 5 minutes on medium speed, until the dough is soft and smooth. If you’re doing this by hand, once the dough comes together, you’ll want to dump it out onto your floured counter and knead it for about 10 minutes, until it’s nice and smooth. Rub a large bowl with oil or spray it with cooking spray and place the dough in the center of the bowl. Cover it with a clean kitchen towel and allow it to rise for about 1 hour, until doubled in size. In the bowl of stand-up mixer with the paddle attachment (you could also mix this by hand if you don’t have a mixer), add the butter, sugar, flour and vanilla extract. Mix until smooth, about 1 minute. Divide the dough in two. To one part of the topping, add a drop of food coloring gel. To the other topping, add the cocoa powder and knead until it’s cohesive. Once the dough has risen, divide the dough into 12 equal parts. Or better yet, weigh them into balls of 100g. Form the balls of dough into rounds. Repeat until you’ve worked through all of the dough. Take about 2 tablespoons of the topping and rollout using our palms, flatting it into a thin round. Drape it over the round of dough, patting down lightly. Using a knife, cut grooves in the topping like a clam shell. You can also do other types of cuts like criss cross, circles, etc. Cover and let rise until nearly doubled, about 30 minutes. Preheat oven to 350 degrees. Bake for about 18 to 20 minutes, or until lightly golden brown. Allow to cool. Serve with hot chocolate or coffee. My favorite part about having an Instant Pot is how it’s made dinner so quick and easy. It’s literally 10 to 15 minutes away. 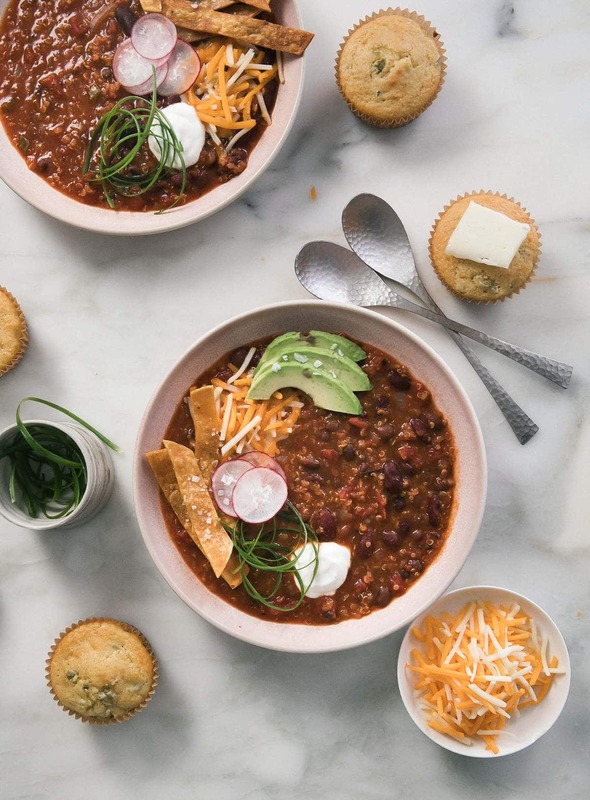 I’m going to admit something to you right this second: this Instant Pot Vegan Quinoa Chili is not mind-blowing. It’s a really solid, easy weeknight recipe. Am I a bad sales woman right now? Lol. I’m just being honest. This isn’t a life-changing type of recipe but rather one that works over and over. I love that it’s humble and easy and knows its place in the world. It’s the type of dish that will you’ll feel good about eating—it’s light and super satisfying. It’s easy to freeze, reheat and add things to. It’s a staple, if I do say so myself. 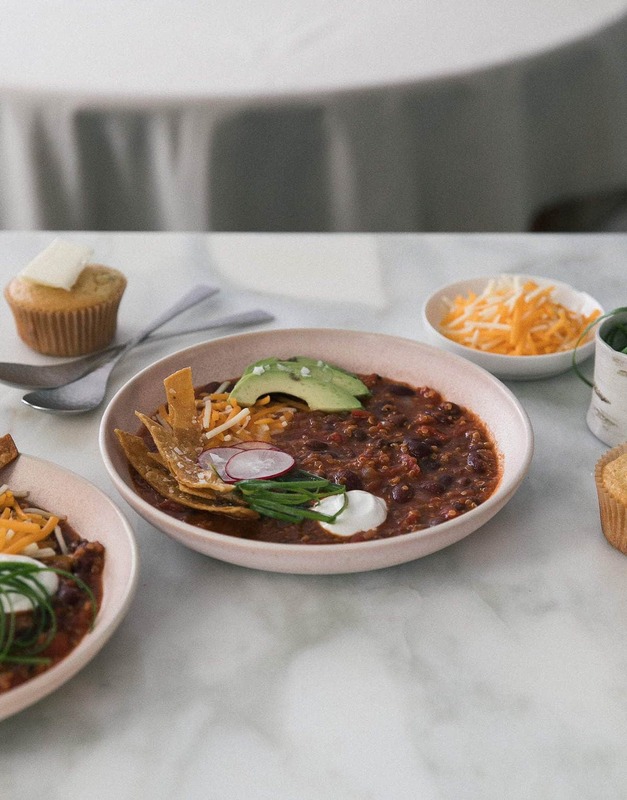 Now, while the chili itself is vegan, the toppings you see pictured are not. But feel free to add vegan sour cream or vegan cheese or anything else you feel like to make it more vegan that it already is. To your Instant Pot, add the oil. Then turn the Instant Pot to “sauté” function (medium heat, if yours has the option). When the oil is warm and glistening, add the diced onion and salt; give it a mix and continue cooking the onions until they’re softened, about 3 minutes. Next, mix in the garlic cloves, cumin, coriander and paprika. Cook for a minute or so. Pour in the fire roasted tomatoes, jalapeños, pickling juice, water, kidney beans, black beans and quinoa. Stir until everything is combined. Place the lid on the Instant Pot and set to “pressure cook” and set the timer to 10 minutes. To a medium pot, set over medium heat, add the oil. When the oil is warm and glistening, add the diced onion and salt; give it a mix and continue cooking the onions until they’re softened, about 5 to 7 minutes. Next, mix in the garlic cloves, cumin, coriander and paprika. Cook for a minute or so. Pour in the fire roasted tomatoes, jalapeños, pickling juice, water, kidney beans, black beans and quinoa. Stir until everything is combined. Bring to a gentle simmer and then immediately bring the heat down to low. Allow to simmer and cook for about 30 minutes, until the beans have softened and all of the flavors are married together. Give the chili a taste and adjust the salt according to taste. 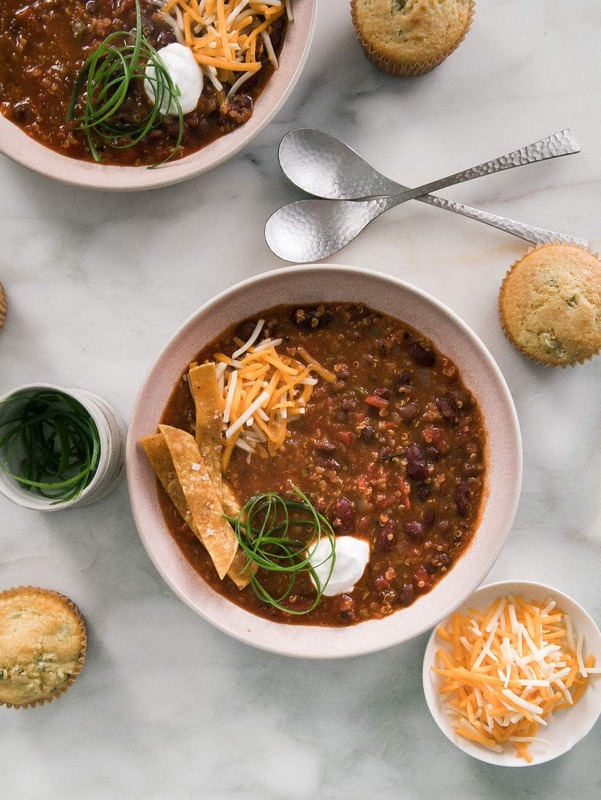 Ladle the chili into bowls. Garnish with whatever you like. I added everything I had in my kitchen: fried tortilla strips, avocado, handful of cheese, sliced radish, dollop of sour cream and sliced green onions. This freezes and reheats really well. Just be sure to make sure the chili is at room temperature and place in a freezer-safe container. To reheat, I would add it to the microwave or thaw it in the fridge and then reheat on the stove. It’s March, which is always a super weird month for me because it’s that awkward time that’s sandwiched in between late and boring winter and early spring. I feel like it’s one of those months when I’m always like, “what should I make? !” Hopefully this list will help us all. 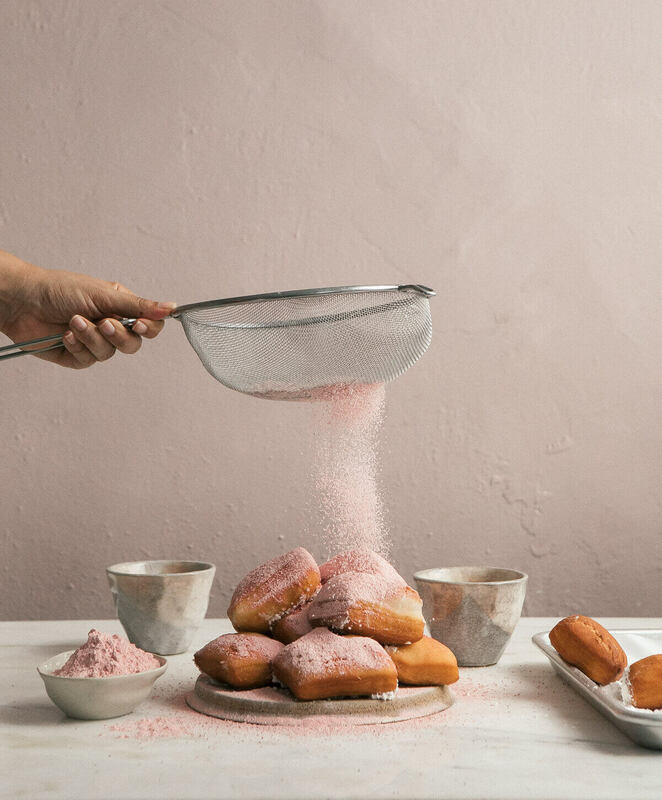 Strawberry Beignets – Fat Tuesday was yesterday and yet these still feel very appropriate. 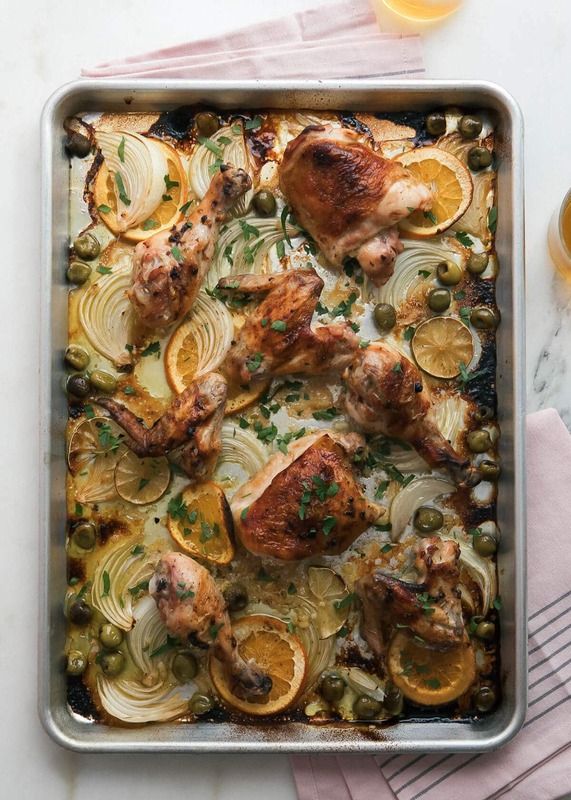 Mojo Sheet Pan Chicken – Winter citrus is still thriving, which means we should all make this mojo sheet pan chicken. 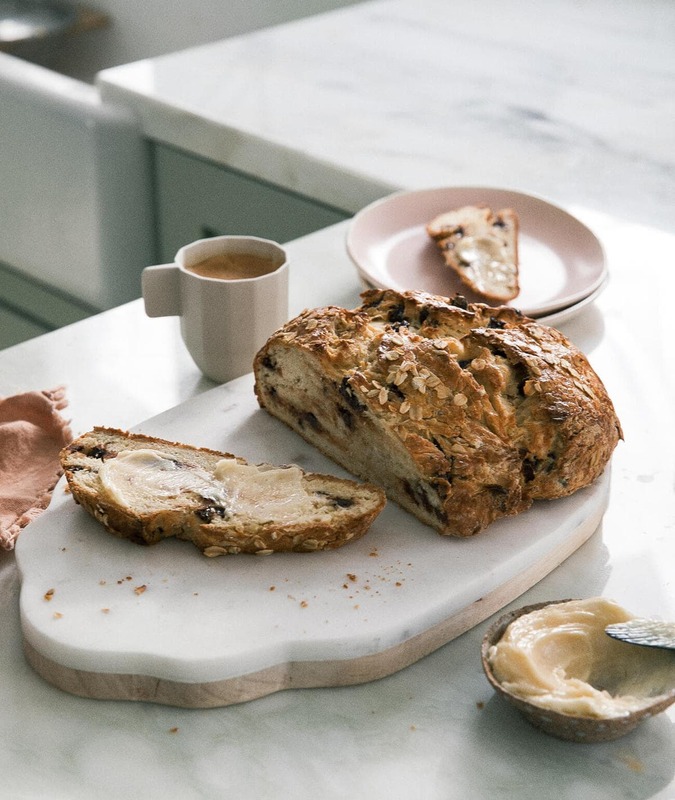 Irish Soda bread – I dislike most Irish Soda Breads because they’re bland and boring but not this one! 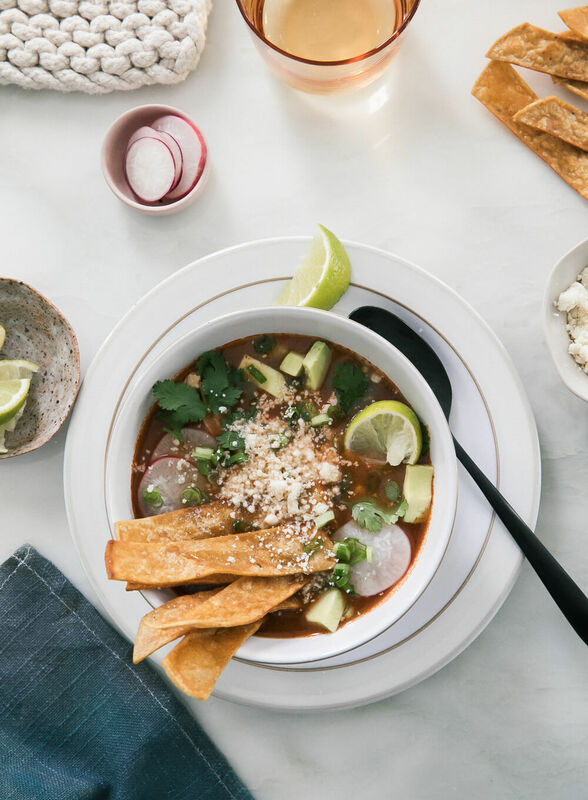 Enchilada Chicken Tortilla Soup – This tortilla soup is one of those soups that can be made in under 30 minutes so naturally it’s a big win. 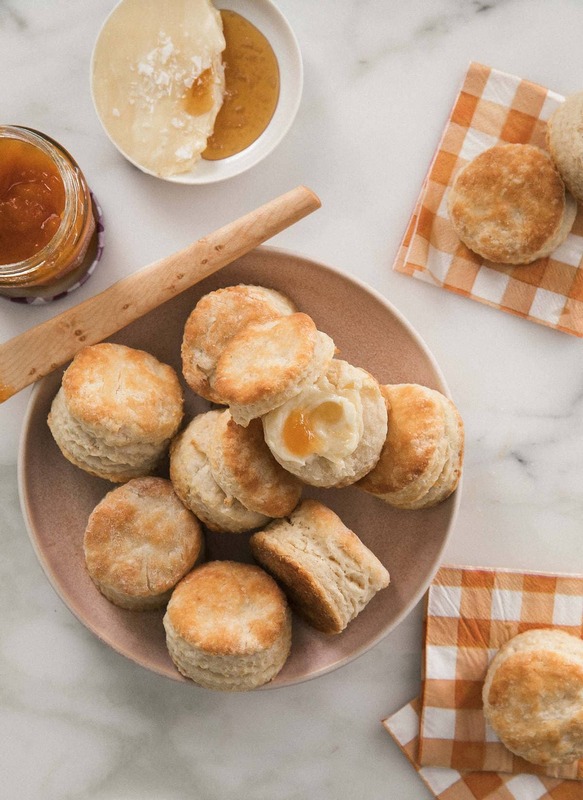 Flaky Buttermilk Biscuits – These might be my favorite biscuits ever and can’t wait to make them soon. Berry Crinkle Cookies – This was my most-made recipe of last month. Everyone made them! YAY! 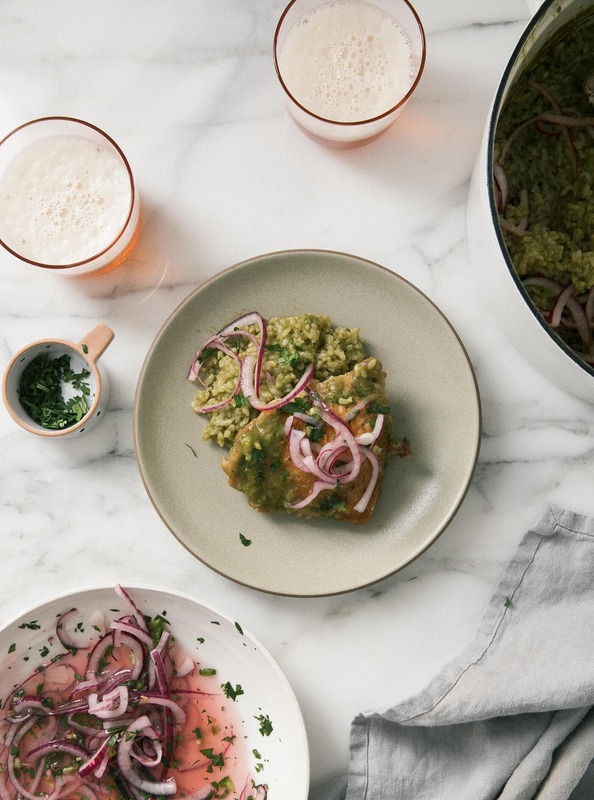 Green Arroz Con Pollo – This Verde Arroz con Pollo is my favorite iteration of arroz con pollo. It’s herbaceous and delicious. I can’t recommend it enough. 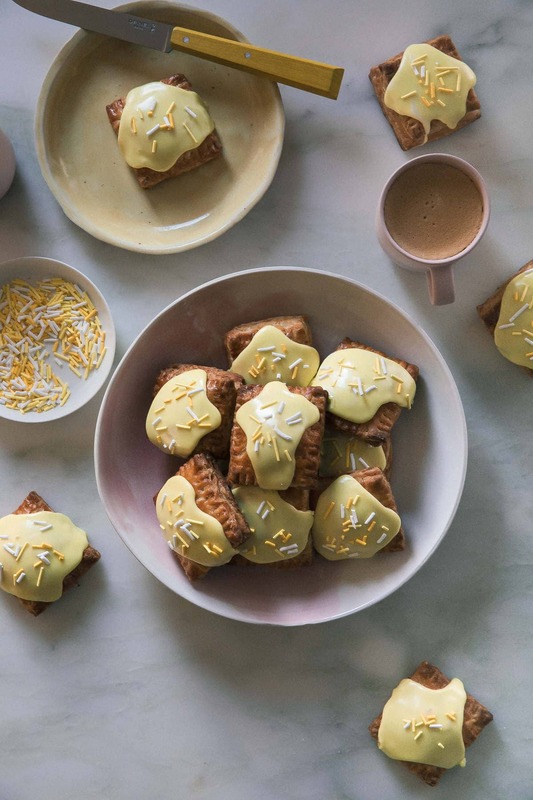 Banana Foster Hand Pies – While the strawberry crinkle cookies were the most made last month, these were definitely the cutest. 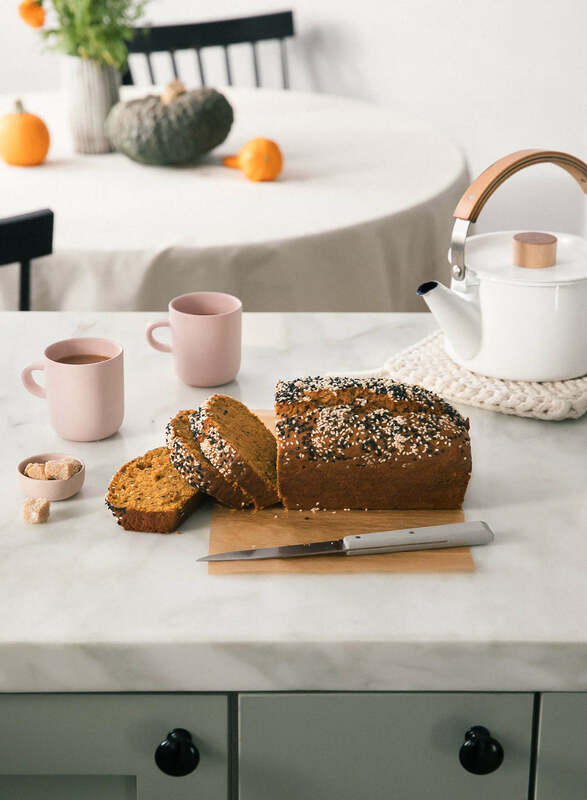 Pumpkin Tahini Loaf – This pumpkin tahini loaf is seasonal, yes, and maybe you only want pumpkin things in October but I swear it’s really good even now. 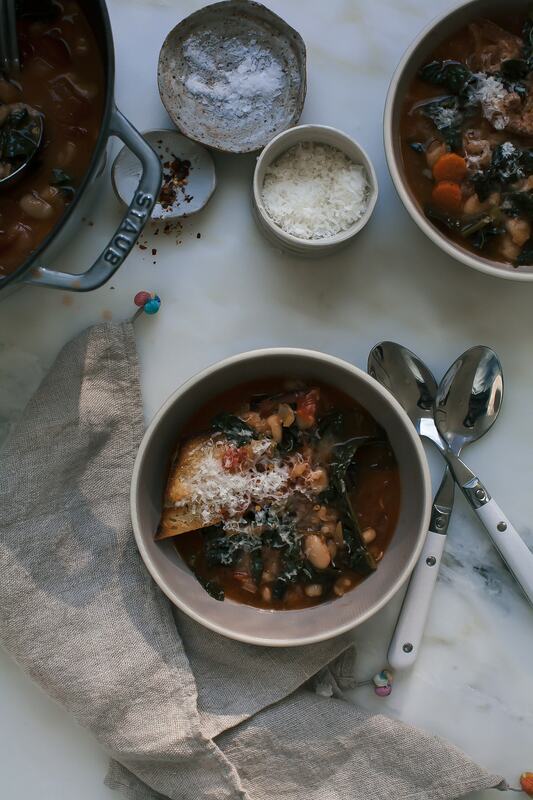 Ribollita – I hear it’s snowing in Chicago and New York and it’s still frigid temperatures. This is the cure to that!